Are you looking for a printable profile of your contacts? The new Contact Profile Report is perfect for printing call sheets or for reviewing a contact's history before a meeting with a donor. You can generate the report by going to the contact tab and clicking the "Profile Report" button or from the Reports > Contact Profile. From there you can adjust the settings to include records from any of the tabs within a contact's record. In addition to running individual Contact Profile reports, from the Reports menu, you can use additional selection criteria to generate lists of up to 250 contacts at a time. Don't see the Contact Profile report in your site? Enable it for your user or ask your site administrator to give you access to it. Watch the Contact Profile report video here. Each of these reports sound great, but the real value emerges when you take action based on this analysis. For example, the value of understanding how the types of donations your organization is receiving could mean that you need to shift your focus. Maybe you need to focus more on online donations and emails than mailings and checks. Maybe the data shows the exact opposite and your online efforts need to be scaled back to include more paper mailings and checks. Every organization is different, so make sure that industry trends are true for your organization before making any major decisions. 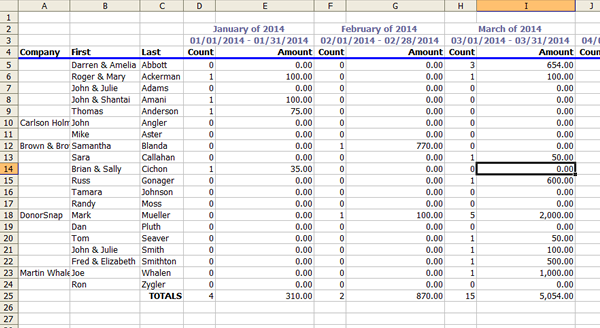 Selecting how to segment your data sets up the rows of your report. You can segment by contact, contact type, organization contact, donation type, campaign, appeal, accounting code, batch code, or payment method. Watch the Periodic Comparison report video here. Running a report that shows you exactly how much income to expect from pledges is now incredibly easy with the Pledge Forecasting report. This report is set up very similarly to the Periodic Comparison report above, but instead of looking at past donations, it shows you expected pledge payments that have not yet been received. 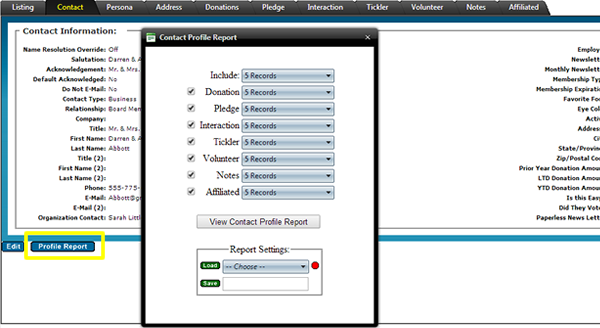 Segment your report by contacts to see pledge payments for individual contacts. If you'd rather analyze future pledge payments in a different way, select from contact, contact type, organization contact, campaign, appeal, or accounting code. Watch the Pledge Forecasting report video here. We all know how important it is to keep our databases clean, but we also know how easy it is for routine maintenance to be moved to the back burner as more pressing issues arise. Combining duplicates, standardizing your fields, cleaning up contact data, or even data entry doesn't have to be swept under the rug anymore. DonorSnap is now offering additional services for data cleanup and data entry for organizations who need some extra help. If you are interested in learning more or requesting a quote, please contact the support team at feedback@donorsnap.com.